Skipper Dean Bell praised Fleetwood CC’s dangerous duo of overseas professional Neels Bergh and player-coach Liam Castellas for leading by example in the club’s fine start to the Northern League season. Fleetwood are unbeaten going into a Bank Holiday triple header. 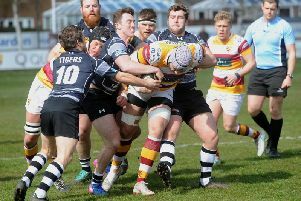 Bell’s side head to St Annes in the league on Saturday, make another short trip to Blackpool in the 20/20 on Sunday and then travel to Rainhill in the National Club Championship on Monday. South African Bergh has started with back-to-back half centuries, while Australian Castellas has also added vital runs in the draw with defending champions Netherfield and last Saturday’s win at Preston. And wicketkeeper Bell, who also led by example with 46 at Preston, says it gives everyone a boost when the pro hits the ground running, with Bergh building on his first season at the club. Bell said: “Neels has just carried on from where he ended last year, and when your pro makes a good start it gives everyone a boost. “Liam too has settled in very well. He started quite a few months ago in March. “We’ve just started training outdoors and had our first grass nets on Tuesday, so everything is going well. And Bell warns there is more to come from this Fleetwood side as he aims to kick on. He added: “We have had a good start and are just looking to kick on because we have a busy couple of weeks coming up. And with three games in successive days, Bell says Monday’s cup clash in St Helens will be a chance to give some of the Broadwaters club’s young guns a chance to force their way into contention. He said: “It is tough, especially fielding a full-strength side for three straight days. The derby clash at Vernon Road is first up against another unbeaten Fylde coast outfit and Bell is not surprised by St Annes’ good start. He said: “St Annes had a good season last year and they know how to win, especially at home. Blackpool will host the first of this season’s Fylde coast double-headers in the Readers T20 on Sunday, when the hosts first face Fleetwood at noon, then St Annes at 3.30pm. Victory at Rainhill on Monday could earn Fleetwood another visit to St Annes in the second round. St Annes beat Ainsdale by 76 runs after Tom Higson scored a 30-ball 70 in their 254-6. Mohamed Nadeem (68) and Amar Ullah (50) put on 121 for the fourth wicket. Lytham also double up this weekend. They head to winless Highfield in the Liverpool Competition’s ECB premier league on Saturday before welcoming second division club Hightown St Mary’s to Church Road on Sunday in the first round of the NatWest Club T20.